I was brought to Steampunk a little late to the game, probably by The League of Extraordinary Gentlemen and Hellboy (which might not be Steampunk…). I really wish I could say books, or music, or even the fashion brought me into the fold, but I was really not aware of Steampunk until it went mainstream enough to have movies. But that look is so cool, I incorporated the sci-fi element into my ghost tour uniform (a black skirt, corset, cape, and top hat) pretty quickly. The DIY fashionistas. I regularly google steampunk just to see the new retrofuture stuff that exists on the internet. H.G. Wells, Robert Lewis Stevenson, and Arthur Conan Doyle’s speculative fiction (particularly Doyle’s illustrations). Sherlock Holmes with Robert Downey Jr. and Jude Law. Neil Gaiman’s graphic novel, Neverwhere. I know, it’s not really steampunk, but damn it, it feels like it to me. The Legend of Korra which also… might not count, but I don’t care about your labels! The official (i.e., Wikipedia) definition is a science fiction/fantasy work which uses 19th-century designs and technology like steam and clockwork, but for me, Steam-punk is a chance to talk about the modern-day issues by making them relevant to our history. Only without all the limits of actual history (you know, like not having instant communication, or gay rights, or laser guns). I’ll also add that I’ve always had a somewhat tenuous grasp of history. I was convinced Italians still wore togas until I was in middle school. Part of the problem was that I grew up near the Amish and a Native American reservation. My mom used to watch a lot of Anne of Avonlea, and Dr. Quinn: Medicine Woman and something Victorian that I suspect was the BBC. I was utterly unable to differentiate them from the modern day, so I assumed that Canadians, Coloradans, and the British actually acted and dressed that way. I realized this wasn’t true by the time I started reading Robert Lewis Stevenson and Arthur Conan Doyle, but I was a little disappointed that I couldn’t get on a plane and step out and explore Victorian London. Steampunk was a natural fit for my skewed understanding of history and time periods. I think it appeals particularly to female readers. There’s a very exciting genre of adventure/exploration stories that girls kinda got left out of. Steampunk, which always seems to very extremely cool female leads, lets women particulate in that era of progress as changers and not just spectators. But thinking about WWI and progress and classism, and that bright-eyed Utopian ideal in Steampunk, really got my cogs turning for The Scribbling Windhund. I’m not writing about the past in my story in The Fantasist, so I sort of cheated as a steampunk writer. My story takes place in a future where climate change destroyed our current globalized world and forced us into segregated environmental domes where all counties had to reform their old pre-industrial identities. So, Germany becomes Prussia and again reflects the ideals of Fredrick the Great: service to the state, near worship of art and culture, but also a very heavy reliance on its military. Prussia is a very safe sector, where artists and craftsmen are the most highly prized citizens, and over half the population acts as the military/police force supervising the community to keep them from engaging in harmful behaviors. You know, like being too gay. The main character, Otto Lang, is pretty comfortable in this utopic state until he’s asked to interview a terrorist who’s been imprisoned for fourteen years for kidnapping the last Prussian princess. Throughout their interviews, Otto begins to question everything he believes about his sector, and his government, and his life. Eventually, well, I won’t spoil it because you can read it for free here. You can also find an exclusive excerpt on my website, here. 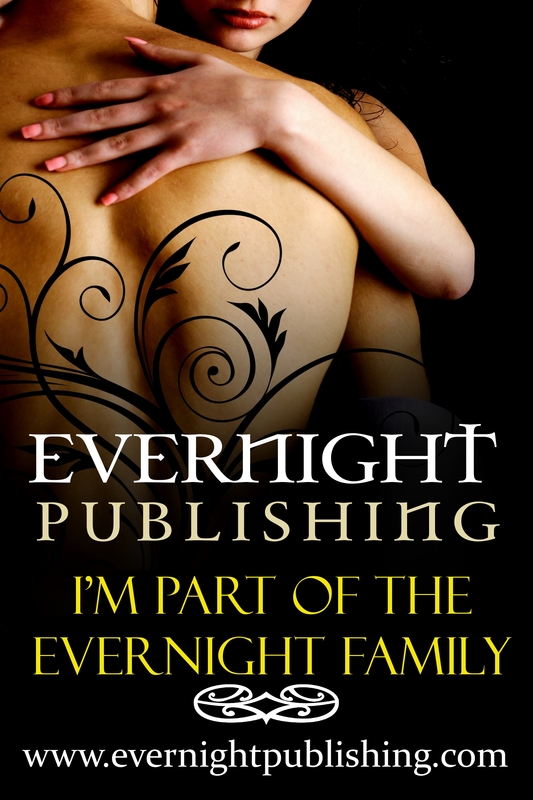 Find Spice & Vanilla at Evernight. Ava Kelly is an engineer with a deep passion for stories. Whether reading, watching, or writing them, Ava has always been surrounded by tales of all genres. Their goal is to bring more stories to life, especially those of friendship, compassion, understanding, and comfort. L.J. wakes up bound to M. Hollis’ wheeled chair, but she is not in her kitchen anymore. Instead L.J. is surrounded by books, cogs, wires, and bubbling liquids. A picture perfect steampunk laboratory. L.J. : Damn! Serves me right for trusting a vampire and her delicious cookies. L.J. scoots and the chairs rolls forward. L.J. : Hello? Is there a mad scientist around? Maybe a minion? Crash that sounds like tools and metal, but also pens and paper. Ava Kelly pops around the corner. L.J. wiggles her fingers to wave. Ava: Oh! You’re awake already. That vampire told me you were a dream factory and would sleep for a hundred years. I hadn’t even gotten around to test you yet! L.J. : Nope, just a friendly writer going around door-to-door in other author’s imaginations and getting interviews. Ava: Aw. Serves me right for trusting a vampire and her discounts. Well, I suppose it’s nothing a sedative won’t cure. L.J. : But the interview? I mean this silliness has gone along quite long enough don’t you agree? Ava sits down and sips from a cup of tea. Ava: You’ll want to know what draws me to F/F romance? Ava: The same thing that draws me to queer stories in general. Diversity and normalizing diversity. Ava: Names are powerful things. I’ve been an outsider throughout my formative years, raised in an allo cishet environment in which queer media was almost non-existent. Ava paces through the laboratory, pausing as they encounter experiments that need fine tuning.Tightening loose screws, pruning idea trees, that sort of thing. Ava: So you can imagine the revelations I had later on, when—through the stories and movies and books of others—I could name the peculiarities of my own person. When I knew that I wasn’t alone. I’d like to bring that feeling to others. I’d like to help them understand who they are, be able to name their demons and thus turn them into trusted companions. Because, hey, we’re all different and that’s what makes us human. That’s a good thing. L.J. : So is untying your guests. Ava turning sharply with a needle full of dream-dust. L.J. : What inspired “It Started Before Noon”? Ava leans against a table stacked high with books and sets down the needle. One of the books stretches, yawns, and patters over to L.J. Ava: That is a very good question, since “It Started Before Noon” is a story about inspiration. Ava: Honestly, I can’t remember what it was that started it all. One moment I was hopping through the mythology multi-verses—Wikipedia is both a burden and a joy, isn’t it?—the next there were storypuffs and muses and scientists looking for romance in a world dry of it. L.J. nods helpfully. But as soon as Ava returns to their survey of the room, L.J. rubs her bound wrists against the hard-ridges of the book’s spine. The book arches up happy with the attention. Ava: I must admit, I have a soft spot for steampunk aesthetics, the visual part of it most of all. The universe of “It Started Before Noon” has that aesthetic, but it has magic. A subtle kind of supernatural energy, persistent, generously infused in everyday life. A resource like everything else. L.J. stops sawing through the straps when Ava turns to look at her. The hard-cover book annoyed bats at L.J.’s hands with its sharp pages. L.J. : That’s really cool. You don’t often see sci fi and fantasy blending like that. Ava nods and collects the stray books and returns it to its tower while it hisses. Ava: The people living in this world are on a spectrum of magic… flux, if you will. Some are immersed in it to their core, it’s part of who they are, what they are. Others are at the other extreme, oblivious to its tendrils wrapping around reality. Most, however, reside in between, be they creators of magic or simply users. Talida, a muse, is a part of it. Ingrid, a scientist, cannot see it. L.J. : Oh that’s a relationship fraught with conflict right from the start. Ava: Indeed. Their personalities aren’t all that similar either. Talida is easily annoyed, but she also has patience; unless startled, in which case she acts rashly and without much consideration. Ingrid is exuberant, relentless, a little stubborn. Yet, when it comes to tending to her own happiness, she might give up too easily. They fit around each other, not perfectly, but enough to make them gravitate toward each other. L.J. snaps the rest of the strap while Ava plays with a character mixer demonstrating the auras mingling. L.J. : It sounds like you have a really in-depth world for a novella. Was that a challenge for you? Ava: When writing fantasy, the most difficult part is world-building without making it obvious. It’s easy to drop a chunk of text explaining how that particular setting works, its rules, its way of life; but considerably harder to interweave it within the story. Ava reaches into a jaw of descriptors and begins to pepper them around the lab. A ‘thatched’ there, an ‘eye of newt’ here, ‘creaky floor boards’ all around, and ‘smoke swirling upward. The ‘gingerbread fragrance’ thickens. Ava: Let it drop here and there, make its way into the reader’s mind quietly and unobtrusively until they’re there. Until they’re living inside that space with no memory of having to jump through. As a writer you have to know how to open the doors to your own imagination without yanking your reader through. Must have patience, must lure them with crumbs under the canopy, one after another on the meandering forest path until bam! L.J. : Holy cow, we’re in a witch’s cottage. L.J. is now imprisoned in a cage made of hard-rock candy. Ava: Would you like some gingerbread to munch on? L.J. : No, I’ve leaved my lesson about snacking in other authors’ imaginations. What about the romance part of the story? Was that difficult? Ava continues drinking their tea, though they lean against a kitchen counter full of dangling herbs, jars of organs, and vials of electricity. Ava: Romance is… weird, in a good way. There’s a thing I noticed over the past decade(-ish). Our world demands fiction to be more and more realistic. There’s so much technological progress that science fiction is becoming true. I essentially design artificially intelligent systems in my research. Waves hands and dispels the witch cottage and re-checks their e-mail. L.J. : Ava… is an engineer… That reality is a hundred times cooler than anything I could making up. Ava: Yeah, let me tell you: it’s mind-blowing. Twenty years ago, having an entire computer in your pocket would’ve been too out-there to imagine it as an integral part of our lives. Now that computer can be the size of a watch and you can still write emails on it. And remember those Star Trek comm devices? The only difference is that we’re wearing them around our wrists instead of on our chests. L.J. : I’d give all my money to the person who designs a case for one that clips onto my shirt and stays in place. Ava: One will probably pop up soon enough. So, now we have this world in which the impossible is suddenly not only plausible but also probable, and we start craving reality to bleed through. Romance as a genre is a mirror that distorts reality toward happiness, but the world is sadly too bleak. On the one hand we want to see the possibility of contentment, and yet, on the other, we thrive when it moulds around life as we know it. Ava: Is making it feel possible. Realistic enough to touch. In the end it’s all about fulfilling the purpose of romance: to give hope. And that’s pretty damn hard to do if your heart, as a writer, is not in it. L.J. : Alright, last thoughts. What is your advice to new writers, Ava Kelly? Ava: I’ve seen a lot of advice regarding writing in general, but a lot less when it comes to the struggles of getting your work out there. So I’m going to talk about the publishing part. If you don’t want to self-publish, you have to submit your work for consideration. To a magazine, a publisher, an agent, etc. and convincing them to buy your stories can seem sisyphean. One of the realities of today’s world is that there’s just so much of everything in it. So many people, so much media, a lot fewer avenues of publication. It’s hard to shine from a pool of millions doing the same thing (and this happens not only in art-related fields, but also in research and academia). I’ve been publishing things in both fiction and non-fiction since the late ’90s and oh, boy! I have gotten at least ten times more rejections than acceptances, overall. Haven’t really counted, but that’s in the upper hundreds there. It’s spirit-crushing. Heartbreaking sometimes. Discouraging to the point of hopelessness. The hardest thing about this is to not give up, so how do we endure? Simply don’t stop—don’t set that quill down, that’s your sword! Polish the story, if you must. Rewrite it, reimagine, but never stop submitting. Be patient, let the no’s slide off and get back to it. Persevere. L.J. : This has been a lot of fun for me and now I’m super inspired. L.J. walks away before any of these nutballs from Into the Mystic catch her again. L.J. : Can’t believe I got an interview with the inventor of our future Robot masters. M. Hollis could never decide what to do with her life. From the time she was a child, she has changed her ideas for a career hundred of times. After writing in hidden notebooks during classes and daydreaming during every spare moment of her day, she decided to fully dedicate herself to her stories. When she isn’t scrolling through her social media accounts or reading lots of femslash fanfiction, you’ll find her crying about female characters and baking cookies. Ziggy Schultz closes the mausoleum gate as soon as L.J. passes through. Which is good because L.J. immediately tries to escape. L.J. : There’s a vampire out here! Let me out! The vampire draws nearer licking bubble-gum pink lips, then lifts a tray of oatmeal raisin cookies. The inside of the mausoleum is in fact a very pretty kitchen. Lots of bright colors and a sign over the table that says “forever thirsty” and has a suspiciously red margarita. M: So happy you could join me in my happy home. When I heard Ninestar Press was looking for F/F paranormal stories and I decided to write something for them. Vampire stories always fascinated me for some reason. M. Hollis giggles and flashes her pearly fangs. L.J. eats the cookies. M.: So it was easy to come up with The Hunt. I wanted to write a story that isn’t dark or creepy for once but more about vampire families and how vampires do the transition from newborns to fully formed vampires. That’s how I came up with the first bite being kind of a ritual for some vampires (not all of them feel the itch to bite humans though). L.J. : Cool take on vampires. Life cycle. These cookies are amazeballs! So you’re main character is a teenage vampire? M: “teenage” vampire. She was changed a few days before she turned 19. You can see her on my pinterest. She was scared and alone at the time and she found a family with Carla and Mona (who she calls Mom and Mommy). Carla is a writer who specializes in writing books that tell vampires where the safe and dangerous places are to live and visit while her wife Mona is a translator and they kinda work together sometimes. In this world, vampires have secured themselves into a new dimension where they have their neighborhoods and houses in a safe place, but they come out sometimes for food, pleasure or work. L.J. : Nice. So you’ve got two F/F couples? M: Representation is so important. I started reading F/F romance when I was looking for more diverse stories years ago and the more I read the more I figured my sexuality out and my love for other women. So now I like to dedicate myself to reading and writing F/F as much as I can. L.J. : What challenges did you face in writing fantasy/romance? M.: World-building l is always the hardest part for me. I like to write more about the characters themselves than little details so I tend to forget things that other people care about. I guess is something I slowly work with and my beta readers are always helping me out to become a better author. For romance, the challenge is to find a way to tell a love story that will make everyone happy, which is completely impossible. Every person likes different things and you end up making some people happy and some people disappointed. With time, you learn that you can just write a story and see what happens when it reaches other hands. L.J. suddenly feeling very sleepy, yawns. L.J. : Yeah, can’t please… everybody all the… Did I ask about your advice to newbies, yet? M.: Nope. Here, have a seat in this convenient and not at all suspiciously wheeled arm chair. You look exhausted. M. Hollis plumps the pillow on the chair. M.: If you don’t have a good support system, you’ll end up too exhausted to keep going.